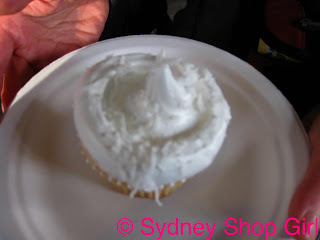 Sydney Shop Girl: The Weeknight Book Club: Life From Scratch by Melissa Ford. 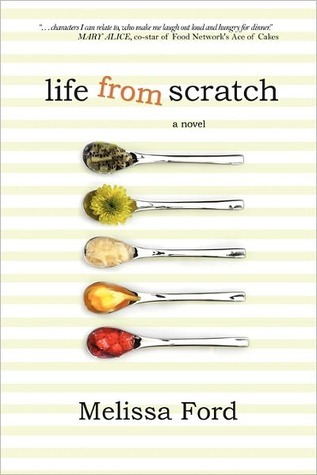 The Weeknight Book Club: Life From Scratch by Melissa Ford. Have you ever read a book hungrily from cover to cover (stopping only to reflect on the 'a-ha' quotes) that you bought with a pretty neutral feeling towards? That sums up my reading of 'Life From Scratch' by Melissa Ford. I have the Amazon Kindle page to thank for this wonderful suprise hit of a novel. As you probably know, the Australian booksellers market is undergoing some pretty big changes at the moment with one of the larger players closing several outlets of both Borders and Angus and Robertson. I had noticed the decline in variety and quality and both chains for quite a while now. My usual ritual with bookstores is to check out the new release and best seller areas first to see if anything interests me. I like the freedom of holding new books and browsing through them. Once I bought my Kindle, I have had little need to go into bookstores. However, I do miss the thrill of making that suprise find. So I did the online version by browsing Amazon's best sellers and new releases and found 'Life From Scratch'. The reader reviews were glowing and the themes of food, blogging and a woman's life are an irresistable combination for me. I made a one click purchase and the rest, as they say, is history. In a paragraph, 'Life From Scratch' is the story of Rachel, a thirty something new divorcee living in New York City. The emotional fall out from the ending of her marriage had the unexpected benefit of setting her free to do what really made her happy. So, she gave up her job as a graphic designer and devoted a year of her life to learning how to cook and to also blog about her life. During the course of the year, Rachel finds a hot new lover, makes a huge success of her hobby and her blog and finally confronts mistakes and misconceptions from her past life - with surprising results. It's pretty obvious just why I bonded so well with this book. It's about food, New York City, blogs and relationship issues that all women of a certain age think about because if they've not directly been affected by them, they have friends in their circle that have. Melissa Ford is a professional blogger aside from being an author and I found her writing style very engaging (perhaps because of this?). The book chapters are interspersed with the character Rachel's blog posts with references to her comments, followers, hits and blog award. Rachel's blog is hugely popular and she talks of daily hits in the region of hundreds of thousands, as well as hundreds of comments a day. I did try to not to feel inadequate by comparison. Honestly. I found the distinct change of tone and tension in Rachel as the novel progressed very interesting because it's something I've never really noticed in other 'women on a journey of self discovery after a major relationship breakdown'. It was uncanny. See what you think when you read it but through her words and thoughts, I felt Rachel's euphoric highs and crushing lows and the anxiety in between as she got her groove back with her rebound man and then as the long term feasability of this relationship played out. Beyond Rachel's outward journey as she found who she was as a single woman, there were some interesting insights into the internal journey everyone needs to go through after a break up. Often we just seem to ask 'why did it all go so wrong?' without truly seeking the answers. What did we (or they) say or didn't say? Were there important things left unsaid, until it was too late? Did we spend those horrible dying days of the relationship under a cloud of misinterpretation of our partner? I found myself reflecting on my own life in these parts of the book and thinking of ways I need to change. That was a pretty intense review. For a Friday night too. 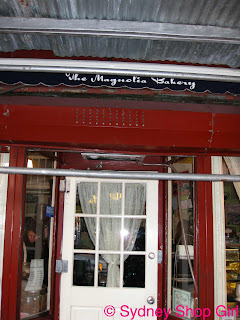 These are some of my photos from the original Magnolia Bakery in NYC. We were there in 2009 and the building was being renovated. If I had staying power, I would have soldiered on and tried their cakes as well. 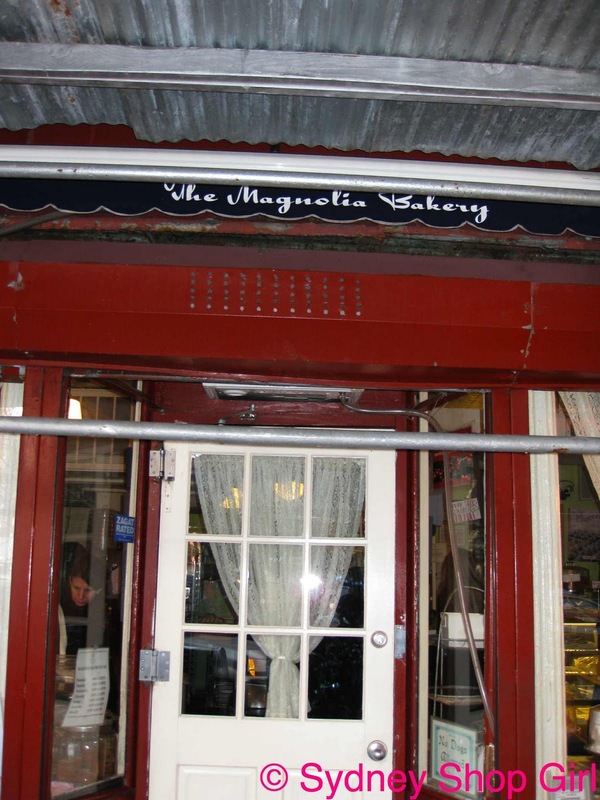 I do recall a wonderful red velvet cake in the window. After this, Mr SSG and I walked past the Louboutin store nearby. Only walked by I might emphasize. My resolve only lasted for that holiday, as regular readers will no doubt know. The book sounds like a great read, exactly the kind of books I love! Thanks for sharing and have a great weekend! MyFavouriteThings: not a problem. Hope you enjoy reading it too. You've convinced me! Sounds like good weekend reading, and I've now got this book, and the new Joanna Trollope novel, waiting for me on my kindle. Kate: it's a deal. I'm looking up Joanna Trollope novels for my Kindle too. I have had a quiet weekend, involving lots of reading - I finished "Life From Scratch" in no time. It was sooo interesting and enjoyable. Also read "Daughters In Law" which is the new Joanna Trollope book, and loved that too. Might have to close the Kindle and see what is going on in the world! Kate: Hello! Glad you enjoyed the book. I have just started reading Joanna Trollope's novel, 'Friday Nights'. I'm a new fan of hers now. Thank you for the suggestion! Cracking up over you trying not to feel inadequate when you hear Rachel's blog stats. I have to try not to feel inadequate too :-) Thank you so much for reading it and I'm so glad you like it.